The exhibition “Red: Art and Utopia in the Land of the Soviets” at the Grand Palais in Paris tells the tale of how the Russian Revolution of 1917 affected the arts under the Soviet regime, but it inadvertently goes beyond that mission to echo uncomfortably with our times, what with a diffuse revolutionary spirit in the air in France, fostered by the Gilets Jaunes (Yellow Vests) movement, and the frightening autocratic tendencies of U.S. President Donald Trump and his counterparts in Russia, China, Brazil, Italy, Hungary and Turkey. After the October Revolution, which toppled the Tsarist government for good, avant-garde art by groundbreaking Constructivist artists with socialist convictions, among them Vladimir Mayakovsky, Liubov Popova and Alexander Rodchenko, was accepted and encouraged. It was a time of great excitement, creativity and productivity in the art world, but it wasn’t to last long. The Constructivists and other avant-garde artists wanted to make art for the people and expanded their purview to architecture, industrial design, graphic design, cinema and theater. The show starts with the model (1919) for a radical building designed by Vladimir Tatlin, the founder of Constructivism. His Monument to the Third International (never built for lack of money), with its high-tech, machine-like design, was a manifesto for a revolutionary melding of art and real life. 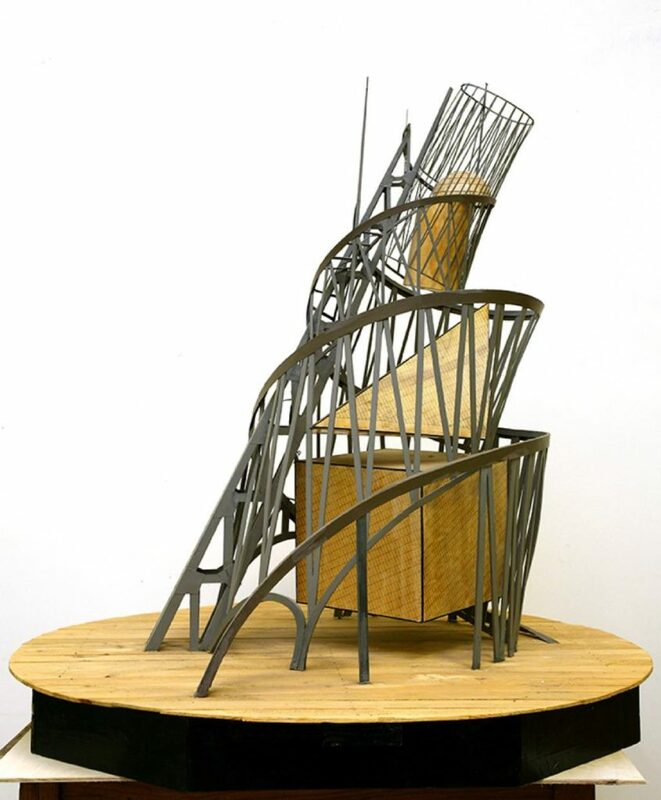 The model became a symbol of the new order and turned up often at demonstrations in the 1920s, but by the beginning of the 1930s, exhibitions of Tatlin’s work were banned. The Constructivists were perhaps best known for their “agit-prop” poster art, meant to implicate the masses in the revolutionary struggle and make the streets “a feast of art for all,” in the words of Mayakovsky, who produced posters for the Bolshevik public information campaign known as ROSTA Windows (ROSTA was the Russian Telegraph Agency). In 1921, Rodchenko declared the end of painting at the 1921 “5×5=25” exhibition, where he presented three canvases, each one an expanse of a single color (red, blue and yellow). “I reduced painting to its logical conclusion,” he said. He was wrong about the death of painting, however. 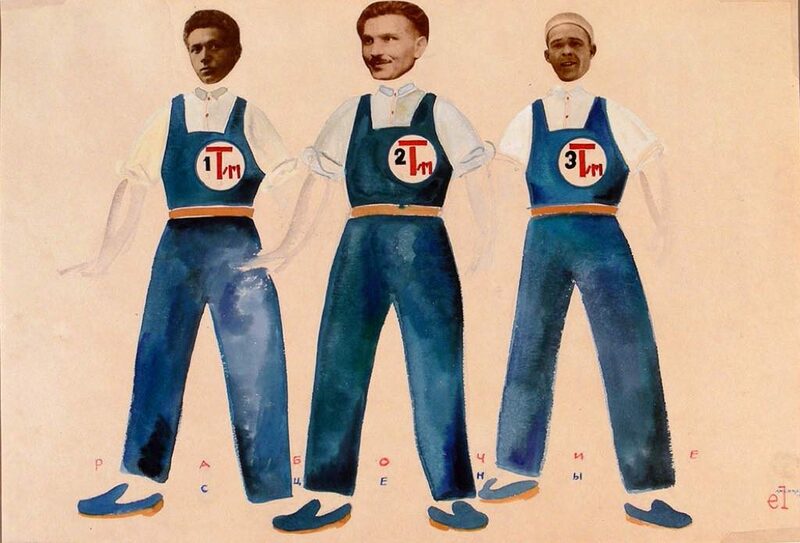 Even so soon after the revolution, the Soviet authorities were already starting to turn away from the radical ideas and works being produced by the Constructivists and other avant-garde artists and toward traditional easel painting that would be “easier for the masses to understand.” Socialist Realism was born. Lots of example of often-mediocre government-approved paintings full of idealized depictions of leaders (notably Stalin) and heroic workers are on show. 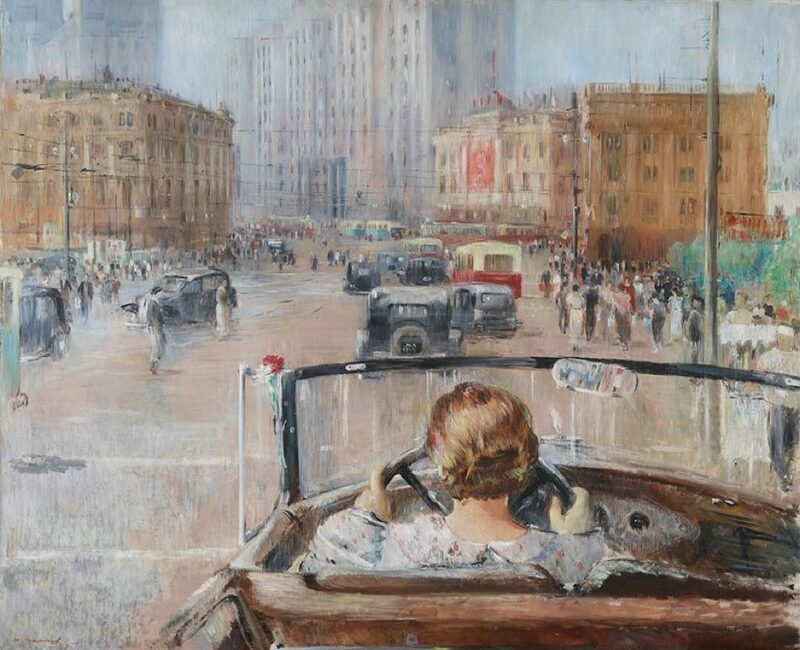 Some, like “Youri Pimenov’s “The New Moscow” (1937), which might represent any capitalist city, are more intriguing. Others, like “Donbass: Lunch break” (1935), by Alexandre Deïneka, are frighteningly reminiscent of Nazi propaganda for the Aryan ideal. “Donbass: Lunch Break” (1935), by Alexandre Deïneka. © Adagp, Paris, 2019. Photo: Collection du Musée National des Beaux-Arts de Lettonie. The show also includes a section on foreign artists sympathetic to the aims of the Revolution, some of whom – like Käthe Kollwitz from Germany, Diego Rivera from Mexico, and Fred Ellis and Jacob Bruck from the United States – traveled to the USSR. There are also examples of the works of such German artists as George Grosz, Otto Griebel and Otto Nagel, who were represented in an exhibition that traveled to the Soviet Union in 1924. Although Constructivism fell out of favor with the Communist Party, it lived on in the Bauhaus, where many of its proponents taught, and, after the school was snuffed out by the Nazis, through the emigration of its professors to other countries. In the end, of course, capitalism triumphed. You have only to look around the gift shop at the end of the show, where you can stock up on Lenin playing cards, arm & hammer sugar tongs or corkscrews, and Malevich dinnerware. Love Constructionists but Le Monde got in big trouble with a Macron Constructivist cover this winter. Open Thursday-Monday, 10am-8pm, Wednesday, 10am-10pm. Closed Tuesday and May 1.